The iGuy is more than just a case, your kids might even grow to think of it as a toy itself! The free-standing foam case fits all full-size iPads and is every bit as protective as it looks. It's lightweight, easy to hold, and can stand up on own two feet, literally! The two arms (grab handles) make it suitable for playing games as well as moving around the house. Plenty of interactive games and apps have a tilt control which is perfectly catered for with this case. iGuy might be a bit bulky for some parents' tastes, and some kids' hands, but the protection here is unrivalled. For the price you can't really complain. This case isn't aimed at kids, so for many parents it provides a suitable half way house between a highly protective case for when the kids are using the iPad and something they would be comfortable using themselves. After all, it can be a pain to keep changing cases when going from the kids using the iPad back to the parents trying to send an email with it! The HandyShell features a unique and sturdy handle that can be used in dozens of ways! HandyShell's strong-hinged handle works great as a thumb ring for a one-handed grip or as a stand in landscape or portrait mode. The Kensington SafeGrip is made of a slightly firmer rubber than the 'squishier' iGuy and Big Grips Frame. This sturdiness is to make it more useful as a carrycase and stand, which is does very well. The carry handle doubles up as a handy two-position stand for viewing and typing., perfect for use at home and school. The iPad screen is always at risk of damage, so the SafeGrip provides a snug screen protection against scratches and smudges. It also features a stylus holder, since a stylus can really help keep oily fingers off the screen while also aiding accuracy. 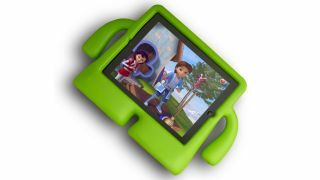 A perfect iPad protective case for young shool kids. The simplest of designs in this roundup, the Big Grips Frame for iPad doesn't win any awards for looks, it's big and bulky, but it's super protective with its soft rubber housing that's sturdy and strong enough to withstand a fair bit of abuse. Coupled with the Big Grip Stand, it makes for an excellent padding for any iPad usage scenario for your kids. That stand is an additional cost though. The case has large gaps for all the ports and switches on the full-size iPad and despite its bulk the case stays firm at all times. For iPad mini owners there's the Big Grips Tweener which is a scaled down version of this case.